The Fairmont Newport Beach hotel in Southern California radiates a dramatic feel from both an architectural and design standpoint. Each and every aspect is designed to surround you in total O.C. luxury. To complete the luxury hotel experience, the Fairmont Newport Beach hotel is thrilled to also offer its full-service urban Spa, TheSpa Sante and Salon. With more than 8,000 square feet of space the Spa features eight decadent spa treatment rooms offering the finest in spa services and using only the finest in products and techniques. Prepare to be pampered like never before. Fairmont Newport Beach welcomes you to the charm and allure of Southern California with its sun-drenched beaches,world-class shopping,and exciting nightlife. Fairmont Newport Beach hotel offers 440 luxury guest rooms, including 54 exquisite suites, most feature over-sized soaking tubs. Fairmont Newport Beach is also gaining favor as one of the most ideal locations for weddings. Of all the special moments of your life there are very few that approach the importance of your wedding day. Having your wedding with us in beautiful Newport Beach means it will be filled with the class and elegance you have ways dreamed of. All guests receive daily courtesy shuttle service to and from John Wayne Airport, Fashion Island, South Coast Plaza, The District and Balboa Island. For rental car information, please contact on-site Hertz Rent-a-Car. Fairmont Newport Beach offers wireless Internet access available in all of our meeting rooms, as well wireless high-speed Internet access in each guestroom. Year-round guests can enjoy relaxing at the hotel's Palms Pool and Cabanas. The self-serviced Business Center accommodates the needs of its corporate guests. Whether you are traveling on business or leisure, you will find Fairmont Newport Beaches central location and well, appointed amenities perfectly suited to your needs. 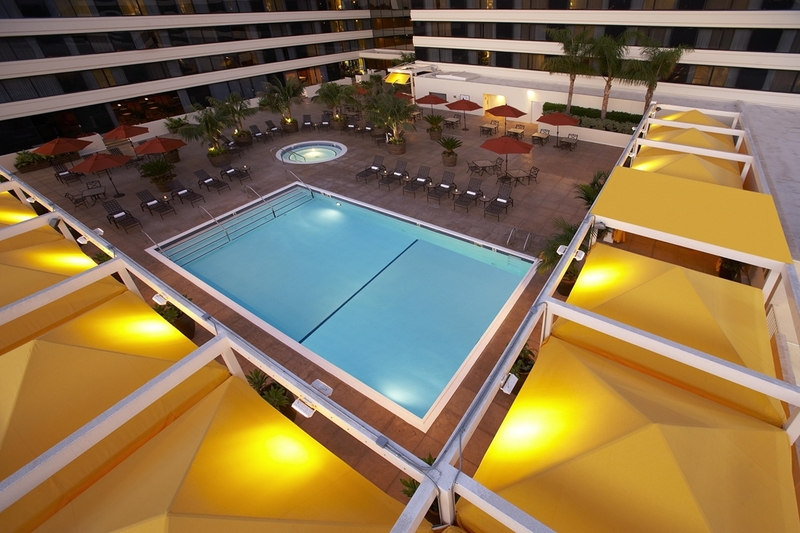 The hotel is situated in the Business District of Orange County, minutes away from Irvine and Costa Mesa. Located less than 2 miles from John Wayne Airport. Balboa Bay BeachesFor parents with small children, the Balboa Peninsulas beaches offer several quiet spots fronting the harbor. Bay Avenue between 18th and 19th Streets is a calm beach well sheltered from the ocean breeze. Ferry, Carousel and activities also. Cannery VillageEncompassing eight square blocks, Cannery Village was once the centre of the commercial fishing industry. Now the canneries, boat yards and marine repair shops have been mostly replaced by restaurants, antique shops and art galleries. Crystal Cove State ParkCrystal Cove State Park contains more than three miles of sandy coves and beaches, grassy terraces and wooded canyons, and 18 miles of hiking trails. The tide pools are marvelous at Crystal Cove and at sunset the water is bright with color. DisneylandAn enchanted kingdom of fantasy and imagination where you can blast off to outer space, venture up jungle rivers and encounter ghosts, pirates, Toons, cowboys and flying elephants. Huntington State BeachHuntington State Beach offers 8-miles of beautiful beaches. Knotts Berry FarmOpen every day of the year except Christmas Day, hours vary according to the season, check the monthly schedule online. Laguna BeachLaguna Beach is Southern Californias premier seaside artist haven. Though world famous, Laguna Beach still possesses a unique small-town charm rarely found anywhere else. Newport Beach Municipal BeachThe beach is open daily from 6:00 a.m. to 10:00 p.m. Amenities include bike paths, surfing and volleyball, food, lifeguards, rest rooms, showers, picnic tables and fire pits. Orange County ZooThe zoo is nestled among the majestic 477 acre wilderness park and specializes in the animals and plants from the southwestern United States. This emphasis on native species is very important for the understanding and education of the public. Special Events CalendarNewport Beach is home to a complete calendar of events throughout the year. You will find information about holiday celebrations, cultural events, and seasonal concerts. Strawberry Farms GolfThe par-71, 6700 yard course is set amid canyons and wetlands. The course offers picturesque vistas across the 35-acre reservoir, large rolling greens surrounded by wildlife and natural vegetation and scenic hills studded with granite boulders. Tustin Ranch Golf CourseThis championship 18-hole Ted Robinson designed course offers private caddie service, a unique and popular amenity at this golf course in Orange County. Experience breathtaking scenery, sparkling lakes and cascading waterfalls at Tustin Ranch. Universal StudiosUniversal Studios Hollywood the worlds largest movie studio and theme park. Wild Animals ParkThe Wild Animal Park is an expansive wildlife sanctuary that is home to more than 3500 animals representing more than 400 species. Its renowned botanical collection represents 3500 species and 1.5 million specimens. Wild Rivers Water ParkWild Rivers is a family amusement waterpark offering over 40 water rides and attractions for all ages. There are slides, inner tube rides, two wavepools, activity pools and lounging areas.